Because I live in a small apartment there is no way I could host Thanksgiving dinner for my whole family. One day I'll be able to host my own large gathering, but until then I'll practice by setting a table and cooking for two. Being that it was the first weekend in November this past weekend, I was in a Thanksgiving kind of mood. Now, I hardly ever cook. So when I told the husband I was making him a nice Thanksgiving style dinner he was excited. 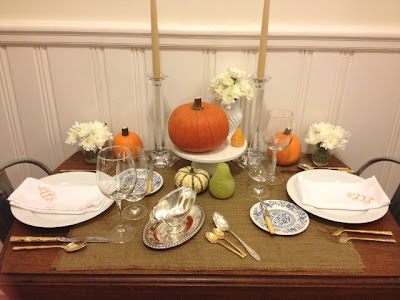 To start, I got out some never-been-used-before wedding gifts, a few thrifting finds that I had long forgotten about, a scrap of burlap from my fabric stash and got to work creating my own Thanksgiving table. Want to know something pathetic? I was going to pull out my wedding China, but crawling under my bed to pull out dusty boxes of china was not happening. They are going to have to wait a few more years at this rate. 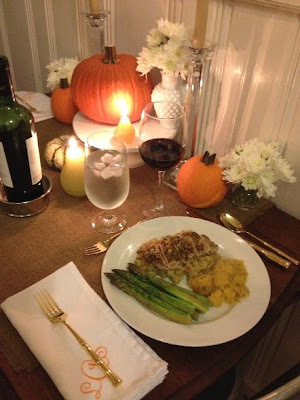 Pistachio crusted chicken over a bed of stuffing, roasted asparagus, and roasted acorn squash. We inhaled it before I could get a good photo of it with the vanilla ice cream. All in all it was a delicious dinner. My hubby was very happy to have a nice home cooked meal and I was happy to make the table look pretty for the first time in years. I really should do this more often! 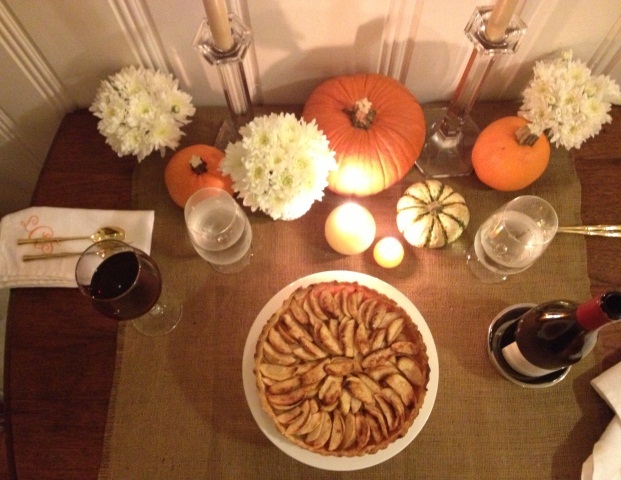 That pie looks delish and I love the tablescape! Majorly envious of that gold flatware - you should use it more often! The table looks gorgeous! 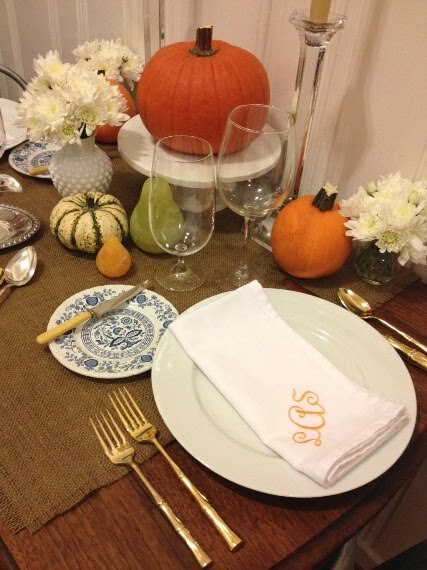 And don't beat yourself up over not using the napkins and place settings for now--the fact that everything was new probably made the dinner feel even more special! Very sweet! 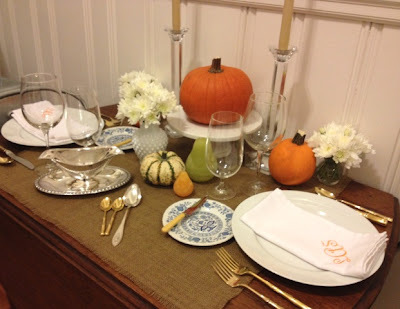 I love the idea of the table set for two! I am going to need to know where this lovely flatware is from. My Christmas china has a gold rim and as ridiculous as it sounds, I just CRINGE when I see the table set with stainless steel flatware and gold-rimmed plates. Would you hate me if I told you I was going to pair it with my silver rimmed china? I know totally clashing, but I kind of liked the gold/silver mix. But, I was too lazy to dig it out, so plain white plates it was! Pretty, pretty table. I bet it was all delicious. You inspire me to want to drag out some of my tabletop stuff. I like mixing it up silver/gold = it's all good and not boring. From what I see, it looks like you cook all the time! 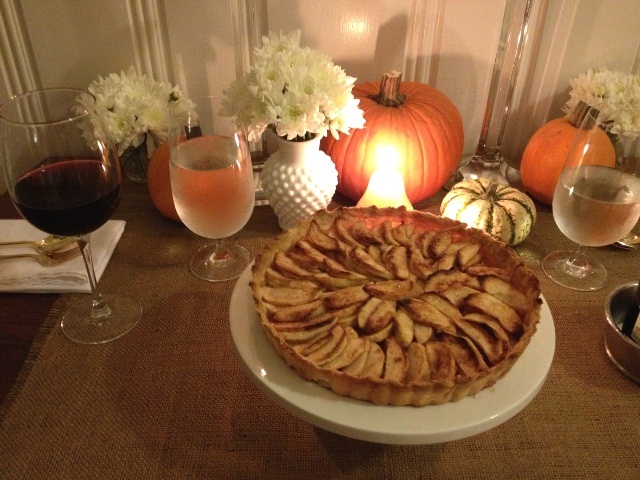 My husband never get desert unless its a pie from the grocery store that he purchased. Love your table setting! you definitely should pull out more of your pieces! yay for pretty napkins!! I'll come over for fake Christmas dinner any time:) Miss you! Can't wait to catch up when I get back!! This table setting is adorable! Love it. And the food looks fantastic...great job.